At 1240h GMT we arrived at the start of our target area: latitude 17 degrees 54 minutes North, longitude 81 degrees 46 minutes West. 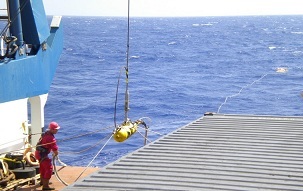 Having hauled in the magnetometer, we deployed the CTD probe for the second time. Four hours later, with the CTD back on deck and the magnetometer back in the water, we headed for the launch site for TOBI (our Towed Ocean Bottom Instrument). TOBI is used to map the seafloor, and is one of the key tools we are using, along with the CTD. TOBI has now been in service for two decades, in which time it has probably mapped more of the deep ocean than any other piece of equipment. While we were launching TOBI, the CTD water samples went straight to the chemistry lab where Carla analysed their dissolved methane content - a telltale sign that there are deep-sea vents in the neighbourhood. We launched TOBI at 1915h GMT, attached to a 100-metre umbilical cable and a 0.75-tonne weight. With the ship travelling at 0.5 knots, a crane first lifted TOBI into the water from the aft deck. As the ship's winch paid out the umbilical cable, TOBI floated out behind the ship. After a quick check that TOBI's communication system was working ok, the deck crew winched the weight into the sea. With the weight in the water, TOBI sank slowly down to its operating depth, a few hundred metres above the seafloor. Being closer to the seabed allows TOBI to make much more accurate maps than we can from the ship far above. By speeding the ship up to 2 knots, we started to tow TOBI across the seabed to begin four days of mapping. TOBI uses beams of sound, send out sideways from the vehicle, to collect information about the seafloor, such as whether it is hard rock or soft sediment. TOBI collects 8000 data points every 4 seconds and sends these back up the umbilical cable to the ship, where we use them to build up a map. TOBI also carries several other sensors to help us hunt deep-sea vents, such as a Light Scattering Sensor (LSS) that detects particles in the water from any black smokers below. Radio communications are crucial during launch and recovery operations, particularly with the Bridge. 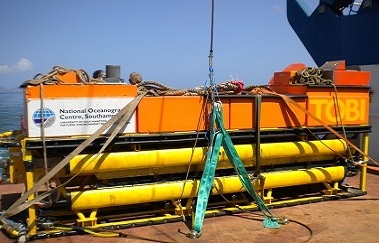 And with heavy equipment, cables, cranes and winch systems in action, no-one should be on deck unless they are working. While we are towing TOBI behind us, the scientists on each watch plot its position and depth every half hour, making sure it is not too close or too far from the seabed. We will piece together all the information from the CTD probe, TOBI, ship's multibeam sonar, gravity meter and magnetometer to build up a detailed picture of the geology of the seafloor, and produce fine-scale maps for the next phase of the expedition - sending down our other undersea vehicles for closer encounters.